Imagine yourself a stately, loyal knight of King Arthur's storied Round Table. Whispers of a treacherous plot against the Arthurian monarchy spurs the great king to dispatch you - his deadliest assassin - to silence his duplicitous political rivals once and for all. Into a conspirator's dark bedchamber you creep - silent and invisible. As you approach the sleeping traitor, you draw a small but lethal dagger and strike! The dawn arrives, and Camelot is safe and calm once more. Picturing yourself in such a scenario isn't so hard when you wield the Knights of the Round Table Dagger - a sinister looking fantasy knife oozing medieval style and loaded with striking artistic details. It boasts a shimmering 7 7/8" false edged stainless steel blade with sleek lines that glint and gleam in the light. The spear point blade is offset beautifully by the antique brass-colored metal guard and pommel - both adorned with intricate designs in stunning 3-D relief. Geometric patterns and swirls cover the gently arched guard, while a regal lion keeps a steady watch atop the diamond shaped pommel. The black molded handle mimics classic leather wrapping and yields a superb hand feel. 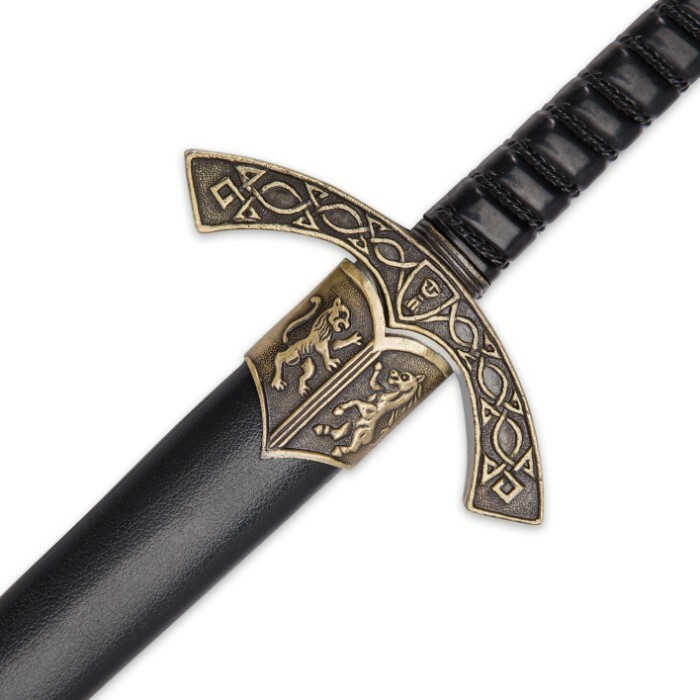 The 12" dagger includes a handsome rigid black sheath, equally well appointed. Stately royal lions and prancing mares grace the antique brass colored metal sheath collar and end cap. The Knights of the Round Table Dagger looks fantastic on its own, or in any fantasy knife collection or Middle Ages display. It's also great as an authentic looking prop for cosplay, theater and other applications, and makes a distinctive, memorable gift. I love knifes, daggers, and swords from the Middle Ages. 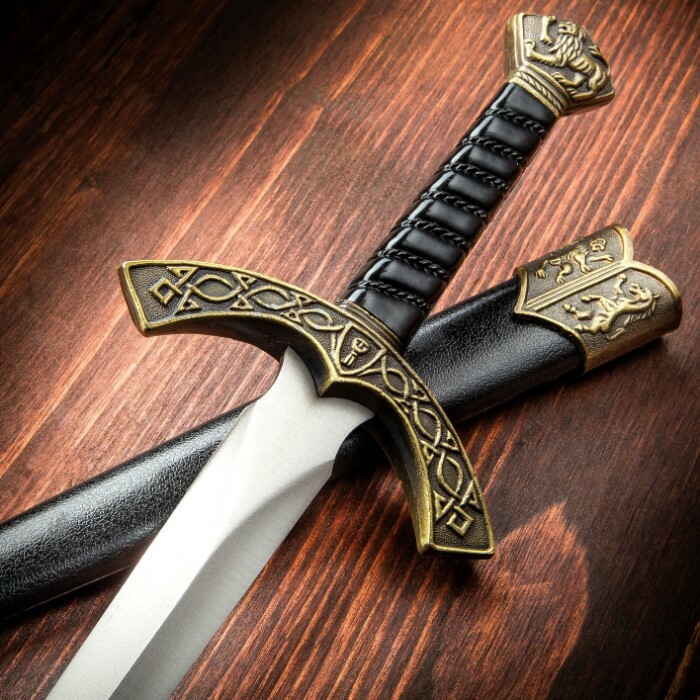 The Sir Lancelot Round Table Fantasy Dagger takes a person back to the time of Middle Ages with kings, queens, knights, castles, and battles from invasions such as the Vikings and the crusades in Jerusalem. The dagger will look great on my book shelf. It may not be very sharp but will be used as a letter opener. It would make a great gift for anyone who collects items from Middle Ages! The Lancelot Fantasy Dagger is a sweet looking display piece. It has a false edge,but that's what most display pieces have. For the money,it's a winner.